Consider a n-channel MOSFET whose terminals are connected as shown in Figure below assuming that the inversion channel is formed (i.e. V GS > VTH) and small bias is applied at drain terminal. Now suppose the drain voltage is greater than zero. As the channel potential varies from '0' at the source to the VD at the drain, current IDS starts flowing from the drain to source because of this potential difference. with ÃŽox = 3.9 Â´ ÃŽo = 3.5 Â´ 10- 11 F/m and tox is the oxide thickness. The operating region where Equation holds is called as resistive or linear region of operation. The important point here to note that 'L' is the effective channel length. 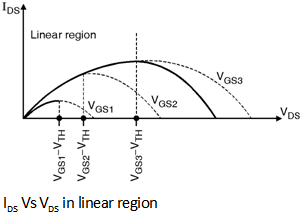 The ID - VDS relation given by Equation represents a parabola which is plotted as shown in Figure below shows for various values of VGS and indicates that the current capability of device increases with VGS. The difference (VGS - VTH) is called as the â€œoverdrive voltageâ€ and the ratio is called as the â€œaspect ratioâ€. If V DS Â£ (VGS - VTH) then the device is said to be operate in triode region. 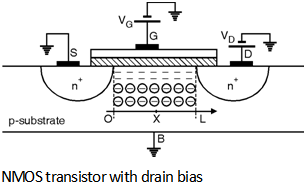 Thus a MOSFET can be operated as a resistor whose value is controlled by overdrive voltage (VGS - VTH).